Sarah and Trevor wanted a wedding day surrounded by family and friends in an unforgettable location. After much searching, they settled on the River Road and Jasmine Houses and Gardens in Lexington, South Carolina, a lush property with the rustic edge that Sarah had always dreamed about. Photographer Katie Jaynes was along to capture every romantic detail of the day for this Columbia wedding. After Sarah and Trevor made the final adjustments to their wedding day wear inside the house, they headed to the courtyard to begin their ceremony. Sarah's favorite part of the entire day was seeing Trevor waiting for her at the end of the aisle. 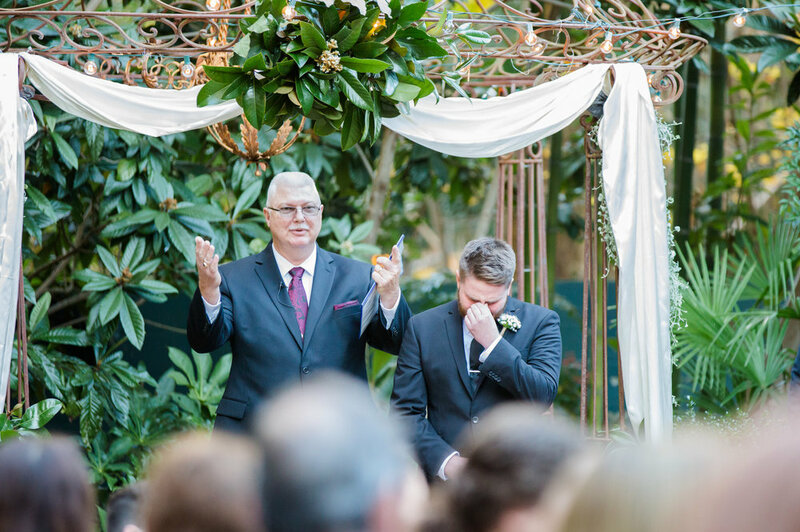 "His reaction is what every bride would want and Katie Jaynes Photography captured it perfectly," states Sarah. With rows of family and friends supporting them, the two exchanged vows in the picture perfect garden. The decorations were kept simple to allow the beauty of the venue and the couple's love to shine through: strands of exposed light bulbs were strung overhead for ambiance and a flowing white backdrop completed the space. After the ceremony was completed, the bride and groom headed indoors for a reception catered by the River Road and Jasmine Houses, and enjoyed an upbeat evening dancing with their guests. As photographer Katie Jaynes notes, the couple's families were at the forefront of the entire day. "One of my favorite parts of their day was the daddy/daughter first look that brought everyone to tears," she remembers of the emotional first look that Sarah shared with her father. Groom Trevor also had an incredible moment at the wedding. He discovered that his brother, who is an active military member, had managed to come home to see the wedding. Says Katie, "I was tearing up watching it all happen while taking pictures. These precious moments made me feel so honored to get to capture Trevor and Sarah’s day!" When she and Trevor were planning their wedding, Sarah hoped that everything would run smoothly on their big day. "We really wanted a simple elegant wedding to share with our friends and family," she recalls. Because they wanted to celebrate and remember those deep family ties, the couple chose to include a sand pouring ceremony. They initially considered a unity candle since Sarah's parents had used one at their wedding years before, but decided on the sand ceremony to personalize their vows. Since they live in Beaufort, the beach is a part of their lives that they wanted to incorporate. "The base of the sand, poured by our moms, was actually the sand from the beach that Trevor proposed on. It meant a lot to us to have this keep sake of not only the wedding but also a piece of where our adventure began," says Sarah.